I never used to drink coffee. In fact, for quite a few years as an adult I despised the smell of it. Then one day I had a good cup of coffee, and it changed everything. Of course, I eased into it, sipping a cup now and again, disdaining a bad cup. Over time I learned that it was possible to get a good cup of coffee many places. Most of all, at home. I went through a series of coffee making devices: Mr Coffee (ugh), single cup filter (OK), French press (good for many years, and still fine). Then I bought a moka pot at a garage sale for $1. Mmmmm, espresso. But as summer rolled around I hated turning a burner on high to boil the pot (no AC in the house those years). I bought an electric moka pot. Bliss! That served me well for a year or two. Then I started experimenting with cappuccino and latte. Along came a milk frother. Tasty, but a real process. So, this week, I broke down and bought a gen-u-ine pump-driven espresso maker. 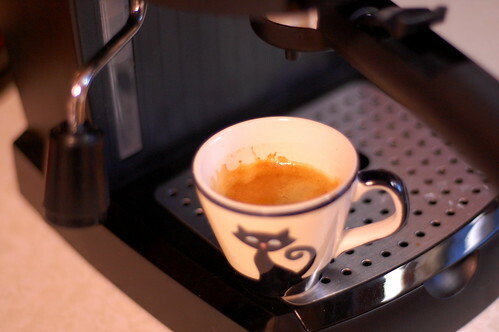 Espresso with crema. Mmmmm! Real steamed milk. MMMmm! I guess I'm hooked. Ahhh.